"Constantly shrinking! It must be the global warming." This, ladies and gentlemen, is the sort of movie we're dealing with. The whole thing is a manic, asinine, and utterly annoying ball of genre cliché, so much so that you could almost pass it off as parody. A string of schemes and misunderstandings and "wacky" situations passes itself off as plot, while a collection of shrill dunderheads fills the spaces usually reserved for characters. The script treats both characters and viewers as complete idiots, leading us by hand through a worthless plot and tiresome punchlines. Thurman plays Dr. Emma Lloyd, a successful radio host specializing in romance advice. She's engaged to publisher Richard (Colin Firth), a fourth-rate Baxter so cartoonishly uptight and schmuckish that it's no spoiler to reveal he will not remain her fiancé by the final act. She's also a controlling witch, snobbishly tsk-tsking her way through the world, chastising Richard for sneaking candy, bossing her listeners around with illogical and inconsistent guidance. Remember this later, when the movie decides we're supposed to root for her. Emma convinces one of her callers to dump her beau - Noo Yawk firefighter Patrick (Jeffrey Dean Morgan) - on the eve of their wedding. Because the writers do not know how to tell a story, Patrick and his pals just happen to be listening to the show at the time, because if there's one thing hard-drinking firefighter schlubs love, it's estrogen-packed call-in shows. Better still, the script - written by two rookies and a sitcom vet - tosses us the old bit where they just happen to tune in just in time to hear the plot point. And yet this is not the laziest part of the screenplay. Naturally, Patrick lives over an Indian restaurant (and, for reasons unknown, has to walk through the restaurant to get to his pad, if only to stop to see poor Ajay Naidu trapped in a real groaner of a thick-accent stereoype), and wouldn't you know it, the owner's son is a teenage computer whiz who offers to hack into City Hall archives and mess with Emma's wedding plans out of revenge. So when Emma and Richard go to get their marriage license, they're told she's already married - to Patrick. Hilarity! Ten points to anyone who's already figured out what's up next. Emma tracks down the firefighter, demanding an annulment; he strings her along, pretending not to know how the mix-up happened; he crashes her various high society shindigs, acting the jerk to embarrass her; they slowly realize they're perfect for each other, resulting in a long, happy courtship (wait... what? ); she finds out about his original ploy and storms out to return to Richard - but will their wedding go on as planned in the final reel? That's hardly enough to fill ninety minutes, so the writers throw a heap of worthless subplots our way. Ample screen time is devoted to an Indian wedding, a cheap attempt at adding ethnic flavor to an otherwise whitebread movie. A mid-movie sidetrack takes us to Emma's father (Sam Shepard), who's dating someone new but has hidden this fact from his daughter, although none of that ever becomes important. There's also some nonsense about Richard's publishing company being in some sort of trouble, and the only way to stop it is for Emma and Patrick (who must pretend to be Richard, because, you know, how else can the filmmakers get you to punch yourself in the head?) to charm some highbrow types (among them Isabella Rossellini and Keir Dullea, and yes, you heard those names right, and yes, they're as out of place as you think), although darn it if they're suddenly charmed not by Emma's high class ways, but by Patrick's filthy boorishness. Also, this is one of the movie's posters. Seriously. As you'd expect, the acting is atrocious, even from established talents Thurman (who resorts to cheap hamminess and shameless mugging) and Firth (who just plain phones it in). Griffin Dunne, who somehow transformed from dependable actor to director of a string of awful comedies, aims low and still misses, his flat, sluggish direction ensuring a complete lack of charm or wit. There's a scene where, while sampling thousand-dollar wedding cake, Patrick gets all slobby and shouts something about Ring Dings, and all the rich people decide they love his crude ways, and then - wait for it - they all sing a song together. It's the sort of clueless, by-the-numbers storytelling that takes the film up that extra notch, from abysmal to completely unwatchable. Detail is just fine in the 1.85:1 anamorphic widescreen transfer, although the film's odd color scheme - some scenes are bathed in orange, others are washed out in white - doesn't translate too well to the small screen. There's also a pinch of grain in a few sequences, if not enough to detract. The Dolby 5.1 soundtrack leaves the action entirely up front; the rear speakers seem rarely utilized, although an immersive sound mix is hardly required. The screechy dialogue is clear, as is the boring musical score. Optional English subtitles are provided. "Matters of the Heart: The Making of The Accidental Husband" (20:54; 1.78:1 anamorphic) is the sole feature here. It's your typical making-of, complete with bland EPK interviews - everybody's wonderful to work with, everybody loves the material, blah blah blah - and on-set behind-the-scenes footage filler. For a featurette this fluffy, I can't imagine why it had to be stretched out to twenty minutes. A batch of previews for other Sony titles is also included; some of these previews play as the disc loads. 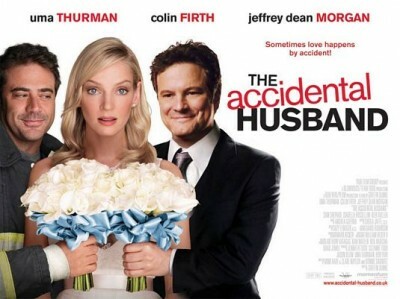 "The Accidental Husband" was filmed years ago, only to waste away in some studio vault until, following a half-assed international run, Sony finally gave it a quarter-assed domestic release earlier this year. They shouldn't have bothered. This is sub-lousy hackneyed crapola all the way, a complete disaster, one of the year's worst movies. Without a doubt, you need to Skip It.